Duncan Dobson was born in Kuala Lumpur, Malaysia and grew up on the San Francisco peninsula. He is an artist, writer, and an entrepreneur in the food industry. A painter since the late 1990s, Dobson takes inspiration from the traditions of Andy Warhol and Mark Rothko. His work in “Hall of Mirrors” reflects his interest in recontextualizing tradition and imagery and cultural figures through a kaleidoscopic lens of color and juxtaposition. Artist Rikki List called a few weeks ago and said she had a surprise – and could I meet her at Art Works? Sure! This Darla replica will replace our beloved Mr. Dog, who was in need of repairs too extensive for continued outdoor living. Mr. Dog has moved on to another life, and now we have the gorgeous Miss Dog. Join artist Barbara Oplinger this weekend for a special Holiday Reception for her exhibit, “Creatures: Paintings and Prints.” Free refreshments, art and gifts for sale. Exhibit extended by popular demand through December 4th. 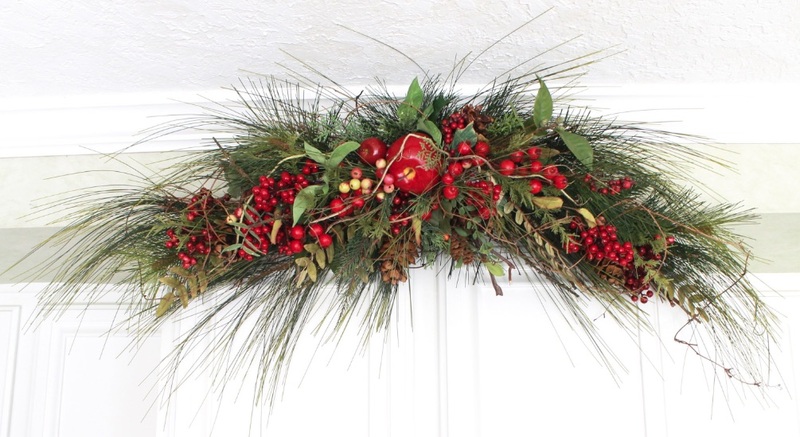 Holiday Reception Saturday December 1 and Sunday, December 2. This event has been canceled due to poor air quality. We hope to reschedule this event for a later date. Please check back. Opening Reception: Friday, November 2, 6-8 pm. 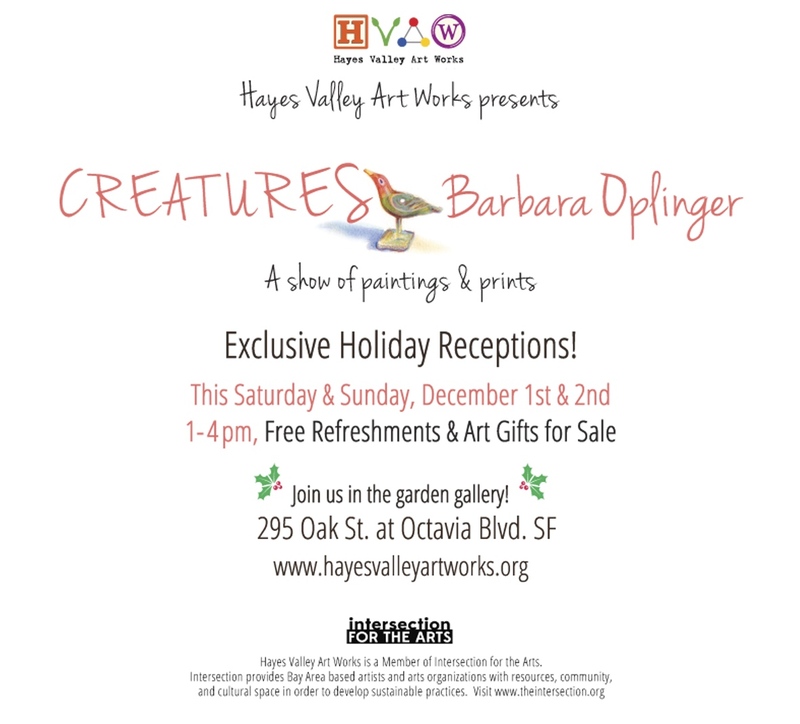 Hayes Valley Art Works presents “Creatures: A Show of Paintings and Prints” by Barbara Oplinger. Bay Area artist Barbara Oplinger brings her love and sensitivity for all animals – and the necessity of dogs in her life – to the canvas in this exhibit of recent work. Her colorful paintings express devotion to all kinds of creatures with whimsy and metaphor. Barbara earned her BFA at the School of the Museum of Fine Arts at Tufts University. Her studies in painting, sculpture, stained glass and animation led to eclectic art commissions and a variety of employment, including mask maker for the Boston Ballet’s “Nutcracker,” clay sculptor for Grandmaster Flash’s “U Know What Time It Is” video claymation, and pictorial billboard painter. 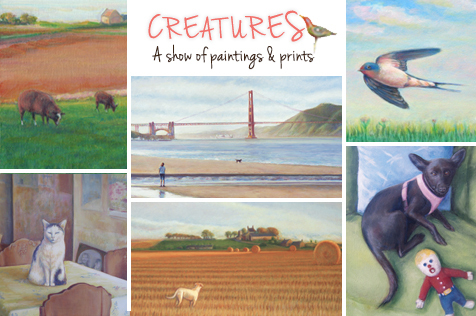 “Creatures” features images of animals she has known or admired. SFAC’s Passport 2018 comes to Hayes Valley Art Works! Please stop by Hayes Valley Art Works to get a unique stamp created by artist René Yañez. HVAW is hosting artist René Yañez’s stamp as part of SFAC’s Passport 2018 series, now in its final year. Rene’s stamp will be administered by his son and artist Rio Yanez. “Passport is SFAC Galleries’ signature event that puts the art collecting experience in the hands of the general public! Local artists will be stationed in venues throughout Hayes Valley/Civic Center and Passport attendees can “create” their own limited-edition artist’s book by collecting original, artist-designed stamps in a customized “passport” notebook. I want to go! How do I get a Passport? Step 1: Purchase your passport for $25 here. Passports will also be available for purchase the day of the event at Passport Home Base (Patricia’s Green) and at Passport Outpost (SFAC Galleries). Only official Passport 2018 notebooks will be eligible to receive stamps. Step 2: Pick up your Passport and event map at Home Base/Will Call (Patricia’s Green) between 11:30 a.m. and 2 p.m. on Sunday, October 21 come rain or shine. Step 3: Follow the Passport map to local businesses where artists will be waiting to stamp your passport with an original artwork. Step 4: Allow 3-4 hours to complete the route. Bring sunscreen and plan to shop and eat along the way! Hayes Valley Art Works presents “Protect and Resist: Art from The Arc of San Francisco.” The exhibit is a group show featuring the work of artists from The Arc San Francisco’s ArtReach Studios. The artists consider what the words protect and resist mean personally, connecting the creative process to a social issue each individual feels passionate about. Protect and Resist reflects various historical lessons, discussions, and collaborations surrounding the themes of art and activism. This focus on the intersection of personal expression and personal politics gives each artist the opportunity to explore ways to communicate complex political and social issues through striking visual forms, from poster art to large-scale paintings to mixed-media sculpture.The center of this exhibit is the “Recycle Tree,” a large mixed-media installation that was conceived and designed by ArtReach Studios artists. 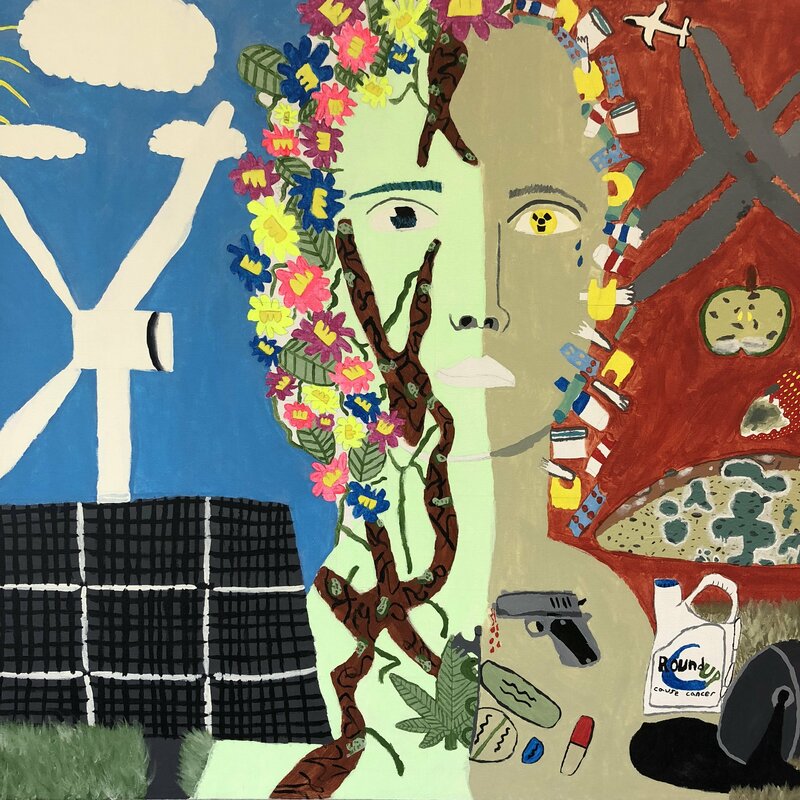 As a group, they collaborated on a single idea that would reflect everyone’s mutual passion for protecting the environment while also resisting against the pernicious forces that threaten its health and longevity. The installation was hand-built from all recyclable materials and is a physical reminder that everything we consume has a direct connection to the natural world. About the Arc: The Arc San Francisco is a lifelong learning center for adults with intellectual and developmental disabilities serving over 700 clients in San Francisco, Marin and San Mateo counties. Our two art programs, Howard Street and ArtReach Studios, promote the advancement of visual artists from The Arc SF through exploration, education, exhibitions and entrepreneurship. Our artists create fresh, powerful artwork that reveals not only innate ability, but also a point of view that is important and unique in our community. We believe it is important to connect with those who share our vision of promoting inclusion and diversity in our communities through art, and we hope you enjoy our work. More information on our Facebook Event page . 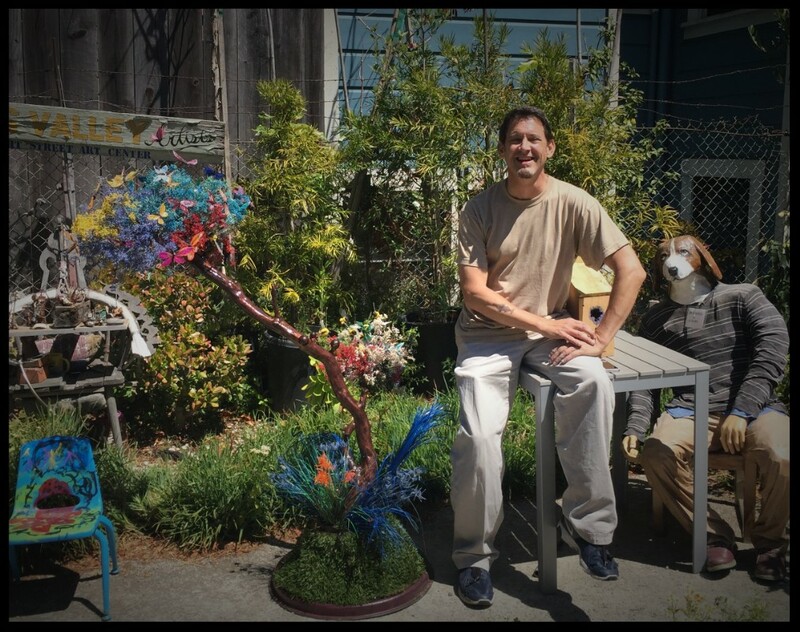 Transform plastic water bottles into flowers, led by The Arc of San Francisco – bring a plastic water bottle to make into flowers that like those on the“Recycle Tree” that The Arc of San Francisco is exhibiting in our sculpture garden, made entirely of recycled materials. Please bring empty plastic water bottles to the event to transform! Transform the Maker’s Shed into a community Portrait Gallery – Create portraits – of yourself, friends, neighbors, pets, or other community members – to transform the wooden Maker’s Shed on site into a community portrait gallery using reused and upcycled materials. Please bring any materials or recycled materials from the neighborhood to use in your portraits. All portraits will fit into approximately 3″ diameter roughly circular spaces on the exterior of the Portrait Gallery. Transform t-shirts into tote bags – Please bring an old t-shirt to transform. Inspired by The Wear Movement to reduce textile waste in SF. 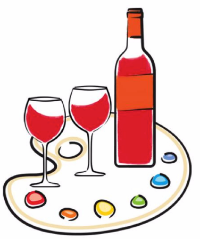 Mix together: wine + paint + friends = Paint and Sip Night! Join us for a delightful autumn evening of wine, paint, and friends at Hayes Valley Art Works! We are in discussions with our merchant neighbor, San Francisco Wine and Cheese, to provide delicious wine. We’ll provide the paint and supplies. You provide the fun and creativity and a memorable night! We’re looking to start Wine and Sip on Tuesday or Wednesday evenings later in September …. date and time to be announced soon! Let us know if you are interested in pre-registration for this event! FREE EVENT: Mid-Summer Art Party: Make Art! Sip Wine! & Volunteer for HVAW! Join us for a fun mid-summer art making and refreshments as we celebrate the Summer Pop-Up exhibition — sign up to volunteer at Hayes Valley Art Works! 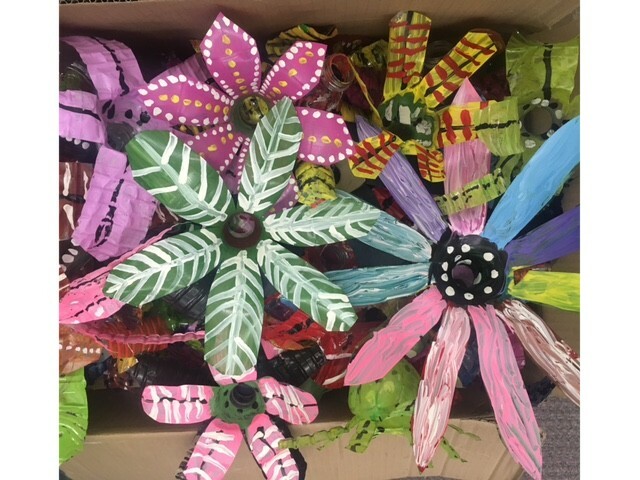 Learn some of the secrets of internationally know artist Todd Young as he leads visitors in making butterflies from feathers and bees from secret ingredients! Later, David Duckworth will demonstrate brush and ink techniques, with watercolor. And a surprise guest may join us to teach tie-dye techniques! Artist Todd Young unveils his new piece, “All Natural Ingredients” – he will teach us how to make the butterflies and bees that populate the piece. Free, donations welcome. All ages. 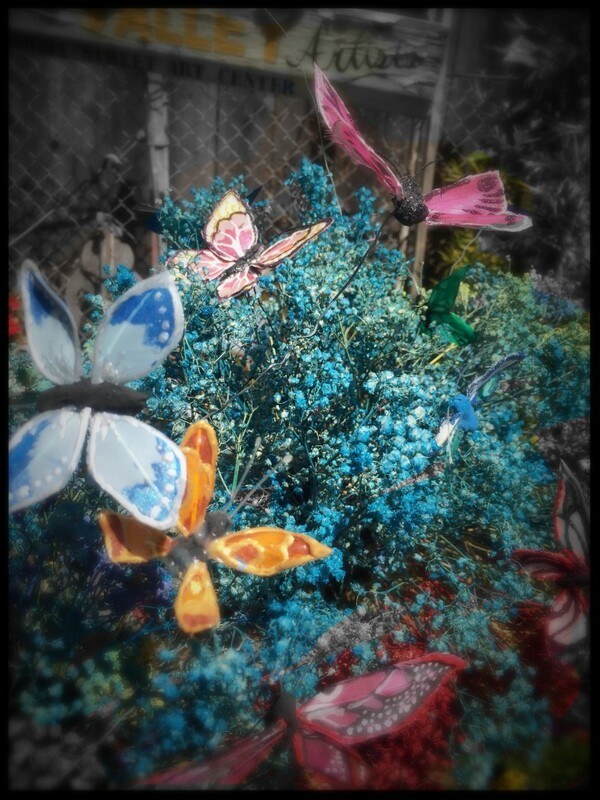 Please join us from 1-3 pm in the garden for a celebration of our one year anniversary at our site on Octavia. Advanced floral designers Tisha Kenny, Kathy Chen, and Kazuko Yoshida will demonstrate artful arrangements, using plants from our garden. 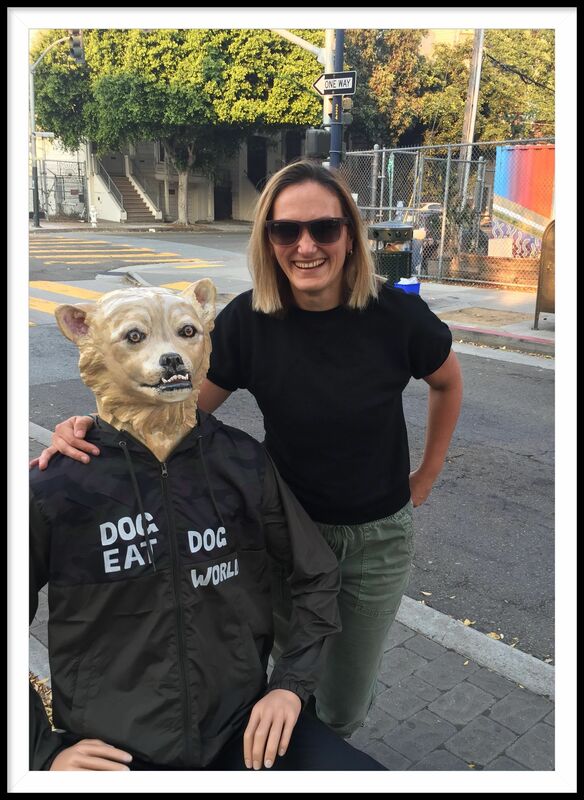 Rikki List’s popular Mr. Dog sculpture returned – just in time for Design Week! 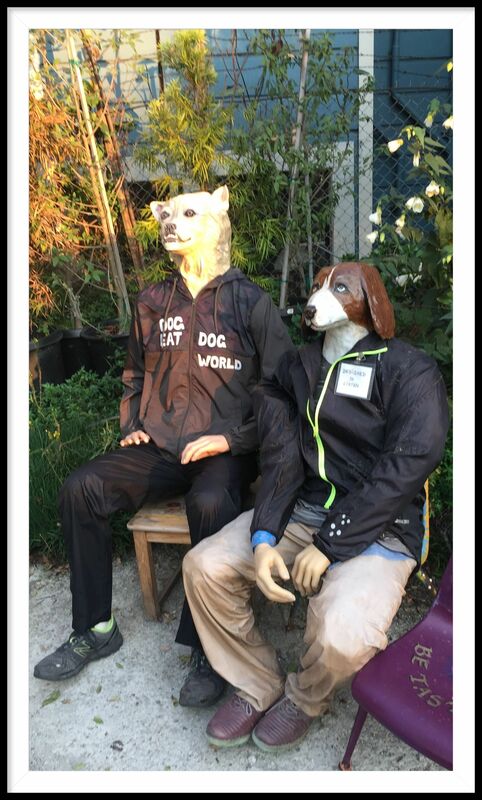 Mr. Dog had a little work done…. a face lift and a new…. sweater! He joined us for the opening of the Pop Up Art show for Design Week in early June, and Rikki and the crew “walked the dog” up to Patricia’s Green, where he enjoyed the Silent Disco and hung out with artist Charles Gadeken (creator of the “Squared” sculpture) and other party goers! Gallery renovation is complete! Please stop by to see our current show, featuring works by local artists Todd Young, David Duckworth, Rikki List, Stephen Santamaria, Daniel Farnan, Barbara Early, and other artists. Todd Young’s piece (below) has not been exhibited publicly for many years – make sure to take advantage of this rare opportunity to view! Other artists and work will rotate in and out until our next exhibit in August, so stop by often! Please visit our garden and join us for Maker’s Fridays (12-2), Art in the Garden Saturdays 12-4, Writing and Weeding Sundays 12-3. Or stop by any time during our open hours, Friday, Saturday, Sunday and Monday 11-5. Year of the Dog: Exhibit and Lunar New Year Party! SATURDAY FEBRUARY 17 from 1-5 pm, a celebration of Lunar New Year and the opening of our new exhibit: Year of the Dog. Featuring canine themed art work by local artists Delaine Hackney, Rikki List, Barbara Oplinger, Rhonel Roberts, Eva Sacher, and Ashley Siemon . Live Music by Joshua Brody, performance by Skate Stone, poetry by Frank Andrick, labyrinth building with Mary Teetor, and refreshments will be served!! Kid and dog friendly – dogs on leashes please. CLICK HERE FOR MOON AND DOG SONGS! Exhibition runs Feb 11 – March 22. Gallery hours Friday, Sat, Sun & Monday 11-5 or by appointment. We are pleased to announce the opening reception for “Future Forward: Works from The Arc San Francisco” on Saturday, December 2, from 1-5pm. The exhibition is presented by The Arc of San Franciscoand features art works created through their art program. The exhibition will remain on display through mid-December. This Holiday Art Pop Up and Drawing Soiree is organized by The Pulse of the Arc. Enjoy the art work, refreshments such as wine, apple cider and donuts, check out the wonderful artwork – and create some art for yourself. Drawing materials will be provided. Proceeds of the event to benefit The Arc of San Francisco, a nonprofit organization. The Arc San Francisco endeavors to transform the lives of adults with developmental disabilities by advancing lifelong learning, personal achievement and independence. Its art studios provide a unique arts academy environment where adults with developmental disabilities can pursue art as a means of personal expression and to develop new skills, connect to a larger art community, and realize financial gains through sales of their work. Students in this innovative program get support in pursuing a major course of study, as well as encouragement to try different art forms in expressive, visual and media arts. 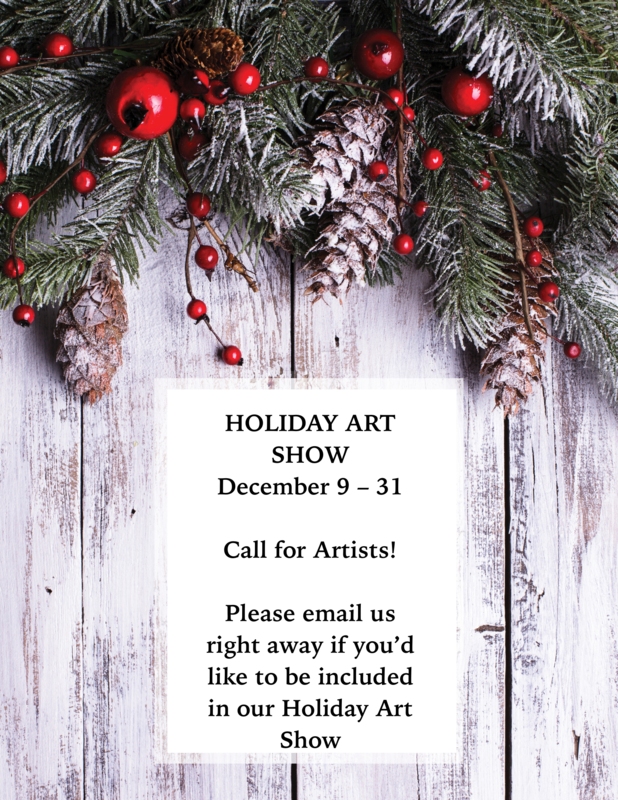 “Green” your holiday celebrations by adopting a future street tree! Friends of the Urban Forest (FUF) will be hosting a tree pickup event at Hayes Valley Art Works Parcel S on Saturday December 2nd and Saturday December 9th. Join us for hot cider, donuts and cookies when you pick up your living tree, or stop by to see some of the other FUF trees on the site. Friends of the Urban Forest, in partnership with the San Francisco Department of the Environment, offers living, potted Christmas trees in November and December each year. For a tax-deductible $75 donation, you get a beautiful, three-to-six-foot-tall, non-traditional tree to bring home for decoration and enjoyment. For more information visit the FUF Green Christmas Trees webpage or order your tree here. Stop by for crafts and bubbles during the Hayes Valley Block Party Family Day on Saturday, December 2 from 3-6pm. Wear your favorite costume and join us for Halloween activities like pumpkin decorating and bobbing for apples. Bring a remembrance of a loved one who has passed away and include it in our Day of the Dead altar-making activity. Or just stop by with some tricks or treats to share, and see the current gallery exhibition before it closes. Come and join us for our two inaugural events – a soft opening of our new space at Octavia and Oak, and the opening of our new Nexus Gallery inaugural exhibit. Saturday, September 23, 2-6 pm. The gallery’s inaugural exhibit is “Quintuple: 5 Artists from the Heart of Hayes Valley.” Earl Speas, Barbara Early, Jennifer Maria Harris, Stephen Santamaria, and Daniel Farnan exhibit work focusing on five variations on the theme of vision: how we see life and movement; how we see ourselves in relation to others; how we see and learn to interpret nature and the world around us; how we shape our vision through our stories, both those we tell ourselves and those that we learn; and how our vision shapes community and connection. Please and join us to celebrate a vision of community enhancement through creativity and joining together in our new garden space and gallery. Hayes Valley Art Works has moved! We are now located on Octavia between Oak and Lily, in a new space with our container gallery, new programming, and upcoming shows. Site set-up is well underway, and we expect to be offering new programming this fall. Your input is welcome. Volunteers and artists encouraged as we seek to expand hours and offerings. Through our partnership with Hayes Valley Neighborhood Association we have been granted a month-to-month lease arrangement on Parcel R on Octavia between Oak and Lily. We have submitted our proposal for a longer-term occupancy, and hope for this approval in the coming weeks. Continuing to partner with Friends of the Urban Forest to host young trees for Public planting, we have relocated our soon-to-be street trees and are looking forward to upcoming public planting events. Please come by during our open hours to say hello, currently Friday through Monday 11am to 5pm, as we seek to expand our volunteer pool and open hours. We are a Member of Intersection for the Arts. Intersection provides Bay Area based artists and arts organizations with resources, community and cultural space in order to develop sustainable practices. Visit http://www.theintersection.org. Join us for the opening of Uneasy Structures! “Uneasy Structures” is an emergent installation combining a range of large-scale sculpture practices at an outdoor, public space. Through a variety of materials and scale, each of the six artists explore concepts of borders, fences, corporations, networks, and divisions in relationship to public space. Installed within a fenced-in area, this concept becomes even more heightened. With materials ranging from bread to styrofoam to plywood, there is an inherent need to create in our current unstable moment. This emergent and adaptive way of bringing six artists together is a necessary way of utilizing creative thinking moving forward. This exhibition was organized by Emma Spertus and Samantha Reynolds, Art Program Coordinators for Hayes Valley Art Works under Project O. Project O identifies public spaces in San Francisco to provide emerging and experimental artists with exhibition and residency spaces. By organizing artists and partnering with local art organizations, Project O creates accessible art spaces for the local community and greater Bay Area to enjoy. Bay Area artists experimenting and developing new ideas are at the center of Project O’s focus and support. Join us on Sunday, February 26th, 12:00pm- 4:00pm on the corner of Octavia and Hayes St.
During the month of St. Valentine’s, we call on you to counter hate by creating cards for those in need of love. Michelle Echenique, a mixed-media artist and Hayes Valley Art Works volunteer, will be facilitating a creative space to invite participants to create a love note for anyone in need: friends, family, acquaintances, community leaders, refugees, immigrants, the homeless and others. A Love-In is a gathering or party at which people are encouraged to express feelings of friendship and love, associated with the hippies of the 1960s. It has been interpreted in different ways by different organizations, but is often connected to protesting local, social or environmental issues. 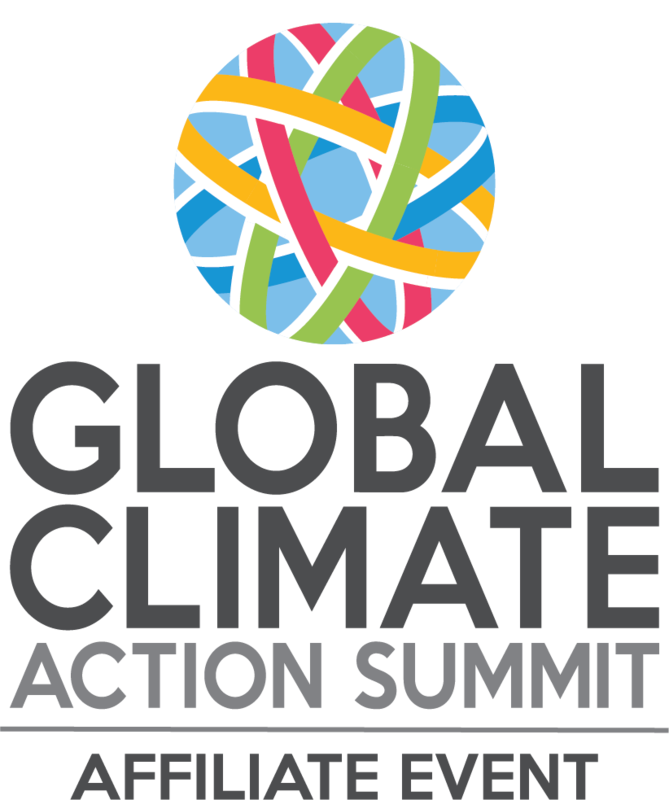 This event is part of the 100 Days Action initiative. Please join us for a special night event celebrating the one-year anniversary of Hayes Valley Art Works! To mark the occasion, this event will also serve as the opening reception for a dual-solo exhibitions featuring work by local artists by Nicolas Hullibarger “Making Space” and Kate Kuaimoku “Semblance of Order”. In addition to the art exhibited, we will have music, refreshments and tents set up in preparation for the forecasted rain. This will be the final event for our 30 day fundraising campaign. Donate Here! Help us meet our Fundraising Goal of $5,000 to ensure arts programming through Spring 2017. Learn more about our campaign and donate through our Indiegogo Campaign. With hundreds of visitors to our community creation space, a $10 – $15 donation from 10% would put us well on our way to keeping Hayes Valley Arts Works a “welcoming open space” in Hayes Valley. In its short lifetime, Hayes Valley Art Works has created a gathering space where neighborhood residents can mingle with professional artists from all over the Bay Area and feel tangible connection to our city’s creative community. With successful partnership-based exhibitions, performances, activity days, and art residencies behind us, we’re already laying the groundwork for new collaborative exhibitions that showcase the Bay Area’s vibrant systems of creative relationships, network of resources, and spirit of creative innovation. Please help us reach our goal by donating, today. Every bit counts! Where the Paint meets the Canvas! Hayes Valley Art Works (HVAW) and Hayes Valley Neighborhood (HVNA) come together for an event to sustain HVAW’s large scale art shows and community programs through spring 2017. Join us for the opening reception of Hayes Valley Art Works’ second open call, Present Ground on Saturday, October 1 from 4:00 – 7:00 pm. Present Ground is free and open to the public. Curated by Samantha Reynolds, Present Ground features work by Johnna Arnold, Andrea Bacigalupo, Lukaza Branfman-Verissimo, Consolidated Studios (Michael Goldman), Yvette Dibos, Ricki Dwyer, Michelle Echenique, Daniel Farnan, fnnch, Kevin Haas, Amy Lange, Eric Lister & Ross Simonini, Emily Peckenham, Cait Petersen, Julia Rittereiser, Stephen Santamaria, Elizabeth Sims and Joshua Peder Stulen. The opening reception will feature a live performance by Georgia Carbone. For more details about the exhibition, please visit here. Hayes Valley Art Works is pleased to present What Century Are These Paintings From: New Works By Paulette Humanbeing. Join us for the opening reception on August 26, 2016 from 5-7pm. The exhibition will be on view from August 26 – September 24, 2016. Paulette will be exhibiting paintings of dogs, the Hayes Valley Artworks lot, and two presidents. Also shown will be production art from the Jeffrey Vallance Interview Film, a painting of the Los Angeles skyline, a painting of a liquor store in Oakland, a painting of 22nd street in San Francisco, and her painting of a Thomas Kinkaide painting. Her paintings are a mixture of studio work and plein air work, done in oil paint. Paulette hopes to show beauty in the things she paints, regardless of how unpleasant a subject may be. For instance, she painted a stuffed dog that isn’t really beautiful, but the paintings of the dog are beautiful, portraying it favorably like when you get the pimples taken out of your high school senior year photos. She hopes that her paintings are lies that tell some kind of truth, like Picasso is quoted as saying except in different words. Join us for the opening reception this coming Friday and then attend the performance of Hamlet afterwards! Join Stairwell’s and HVAW for a culminating open house event on Sunday, August 28, 12-3pm. Explore the site and surrounding area, take part in circuit training of the non-athletic variety and win prizes for doing something, anything, as best you can. Refreshments will be served while supplies last. A collaborative project led by San Francisco-based artists Sarah Hotchkiss and Carey Lin, Stairwell’s creates new experiences that challenge familiar understandings of everyday surroundings. The project has taken many forms, from site-specific interventions to group walking tours to curated exhibitions. Stairwell’s seeks to foster temporary communities of curious and engaged individuals, providing opportunities for connections and changes in perspective. 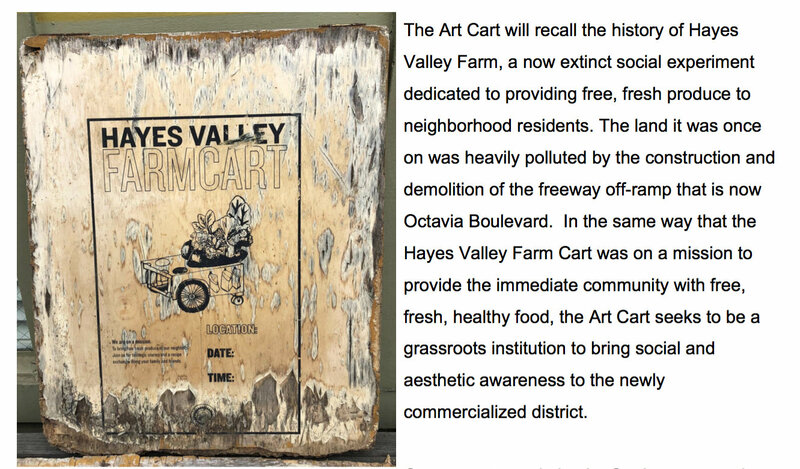 Check stairwells.org and hayesvalleyartworks.org for updates! Directed by Cliff Mayotte with music by Schuyler Karr. On Monday, July 25 from 5-7pm Elliott Cost and Marc Matchak will open an exhibition Peter Gray Hurley: Garden Drawings. Hurley lives and works in San Francisco making visual art and music. More info on upcoming events here! The first 300 people to Donate $25+ will receive a limited edition Hayes Valley Art Works T-shirt, a special gift from our sponsors. Please remember that your donation to Hayes Valley Art Works is tax-deductible!